If you are planning on getting married, there is no better wedding location than Cabo. Cabo has everything you could hope for in a wedding destination. From stunning natural scenery to gorgeous wedding venues, unique culture and every amenity you could hope for, Cabo has it all. This is the perfect place to make your dream wedding a reality. Creative Destination Events is here to help you book your Cabo destination wedding. Let us sweat the small stuff so you don’t have to worry about planning all your wedding on your own. 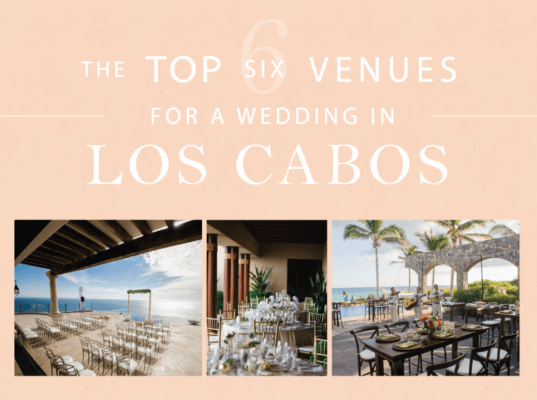 Here’s a look at some of the top Cabo wedding venues. This glorious Cabo venue features contemporary architecture, upscale amenities, a lovely hillside villa and so much more. Villa Bellissima’s 8-bedroom villa is spacious, sophisticated, glamorous and incredibly comfortable. Guests will absolutely love spending time on their terraces while reveling in the glory of these magnificent vistas. Amenities include pool terraces, a gourmet kitchen, a home theater with a 112” screen, a gym with an ocean view and luxurious furnishings. Villa Bellissima accommodates upwards of 100 sit down or dinner guests or 150 standing guests, appealing to the cocktail or party aesthetic and feel. You won’t find a better location than this oceanfront hillside. Villa Bellissima overlooks wondrous Pacific Ocean vistas. Indoor or Outdoor reception, Villa Bellissima allows you to share your dream wedding with all of your closest friends and family. This elegant 9-bedroom venue is positioned on a scenic cliff above the Pacific ocean. Nestled directly above the beach, Villa Turquesa offers 15,000 square feet of indoor space along with 10,000 square feet of outdoor space. If you are looking for luxurious amenities (such as a theatre room) and expansive rooms, as well as incredible indoor and outdoor space, this wedding venue is for you and 100 of your family and closest friends. With an outdoor fireplace, gas grill, stereo system, shade structure, grass yard, hardwood chaise-lounge chairs and dining space for up to 60, Villa Turquesa offers niceties that make its outdoor areas the perfect venue for a wedding. This visually stunning beachfront villa features quite the unique blend of classical Roman and colonial Spanish architecture. The bride, groom and wedding guests enjoy direct access to East Cape’s glorious golden sand. Outdoor facilities accommodate upwards of 40 sit down guests or 50 standing guests. You’ll be hard-pressed to find a more personal and luxurious wedding destination in Cabo. Cabo del Sol provides the all the eye candy and luxurious comfort a bride and groom could hope for. The impressive hacienda style venue with almost 40,000 square feet of indoor and outdoor space joined by retractable glass doors is an aesthetic that impresses all who visit the venue. Cabo del Sol offers various areas for a wedding or reception. With a grassy green golf course providing beautiful views of the desert kissing the sea, or immediate beach-front access, outdoor lovers will find their perfect wedding venue. For an indoor reception Cabo del Sol offers the exclusive Club House of the golf course, featuring vanity areas, dressing rooms, lounges, showers, and dining facilities. If you are looking for a wedding destination that features the best of the sea and the desert, you won’t find a better site than The Imperial Suite at Grand Fiesta America Los Cabos. This venue is as luxurious as it gets. The facility is characterized by its “Grand All Inclusive” concept in which nearly every indulgence you can imagine is provided. The guest rooms provide unparalleled comfort. Meals inspired by the diverse regions of Mexico are served 24 hours a day. International fare is also available. Whether you are looking to soak up the local culture, express your creativity or engage in athletic activities, you’ll be able to do it all and then some at this world-class wedding destination. The best part is that everything is included in the facility’s all-inclusive rate. The hotel has 249 rooms with private balconies that provide stunning views of the sea and mountains. Be sure to check out the on-site SOMMA WineSpa’s wine-based treatments. The venue also features a gym, tennis courts, horseback riding, golf, fishing and diving opportunities. Esperanza is located on the beautiful Baja shores. This glorious tropical oasis covers 17 acres with lovely greenery and direct access to the water. The venue features an award-winning spa, fitness program and gourmet meals made with fresh ingredients sourced from local fishermen and farmers. This is your opportunity to enjoy the sea-to-table dining experience you have always dreamed of. Esperanza even offers cooking classes with acclaimed Chef Guillermo Gomez. Additional activities include sailing, snorkeling and golfing on five championship-level courses. This entry was posted in CABO WEDDINGS, DESTINATION WEDDINGS, WEDDINGS VENUES and tagged Venues for A Wedding in Los Cabos.